This week, Clonakilty was officially named as Ireland’s first autism friendly town. 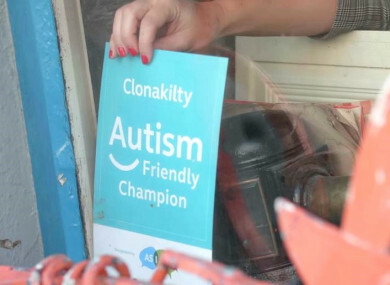 An 'Autism Friendly Champion' sign in the window of a local business in Clonakilty. Clonakilty is a bustling seaside town in West Cork, just a few miles from Inchydoney Beach and with a population of just over 4,500. As of this week, it’s also officially Ireland’s first autism friendly town. Since July, residents, businesses and public service workers in the town have been taking part in training courses and workshops, and have put a range of changes in place to make Clonakilty a more autism aware and autism friendly place to live. “[It] was an ambitious undertaking, but we had the best in the country guiding us,” says Catriona Scally, who owns Scally’s SuperValu in the town along with her husband Eugene. Back in 2015, the team at Scally’s SuperValu started considering small scale ways to make their store a more inclusive place for autistic people: dimming lights, turning off the tannoy, reducing checkout sounds and cutting down on sensory stressors. From these beginnings, SuperValu started a national awareness and education journey to support Ireland’s entire autism community, and identified the town of Clonakilty as the best partner to take the lead on a local level. The plan was to take the changes made at Scally’s SuperValu beyond the store, and out into the rest of the community. With the support of the Irish autism organisation AsIAm and the Middletown Centre for Autism, SuperValu’s project was rolled out across the whole town over the summer months. You hear the word ‘autism friendly’ in many contexts. It was important for us that it meant something. It isn’t just a tick-box process, it’s a constant dialogue. “To start off, we had to get a certain number of businesses and organisations in each category to commit to taking park, be it public services like the Garda station or local businesses like hairdressers or craft shops,” explains Adam. The idea of an autism friendly destination is not a new one – in 2017 the mayor of Channel-Port aux Basques named it as Canada’s first autism friendly town, and similar work has been ongoing for over a decade in Austin, Minnesota – so Adam was keen that Clonakilty was able to stand up to its global counterparts. Each participant worked with a member of the AsIAm team to identify changes that could be made, and committed to making at least one of those within the first few months. The changes could be something like having a quiet time once a week, creating an appointment service, making the place assistance dog friendly, or offering a sensory survival kit containing things like sunglasses for harsh lighting. From there, the locals responded with gusto. At Scannell’s bar, for example, there’s now a sensory kit at the counter and a note on the menu advising customers to let staff know if they’re having trouble with sensory stressors like lighting. Coaches at Clonakilty RFC completed a three-hour training course to better equip them to coach autistic people, and local gardaí and ambulance service members did too. “For an autistic person, going to a new place or dealing with a new environment can be really stressful,” says Adam. The project is part of a three-year plan, and the changes made so far will be monitored over the coming months and years to ensure they are continued. Right now, 86 per cent of Irish children with autism attend mainstream schools, but Adam says society still has a long way to go in learning to support autistic people in the community. Clonakilty’s autism friendly status has only just launched, but this kind of growth has been a long time coming in Ireland, Adam adds. SuperValu is at the heart of 217 Irish communities and is committed to making positive changes to build inclusivity across Ireland. Find out more about SuperValu’s autism friendly initiatives here. Email “'It's a way of saying, we support you': How one Irish retailer is driving change in a West Cork town”. Feedback on “'It's a way of saying, we support you': How one Irish retailer is driving change in a West Cork town”.